Good morning everyone! Two days ago my friend, Madison, asked me over Facebook to create something inspired by peacock feathers. She said "hey sam, I am really into peacock colours and etc. 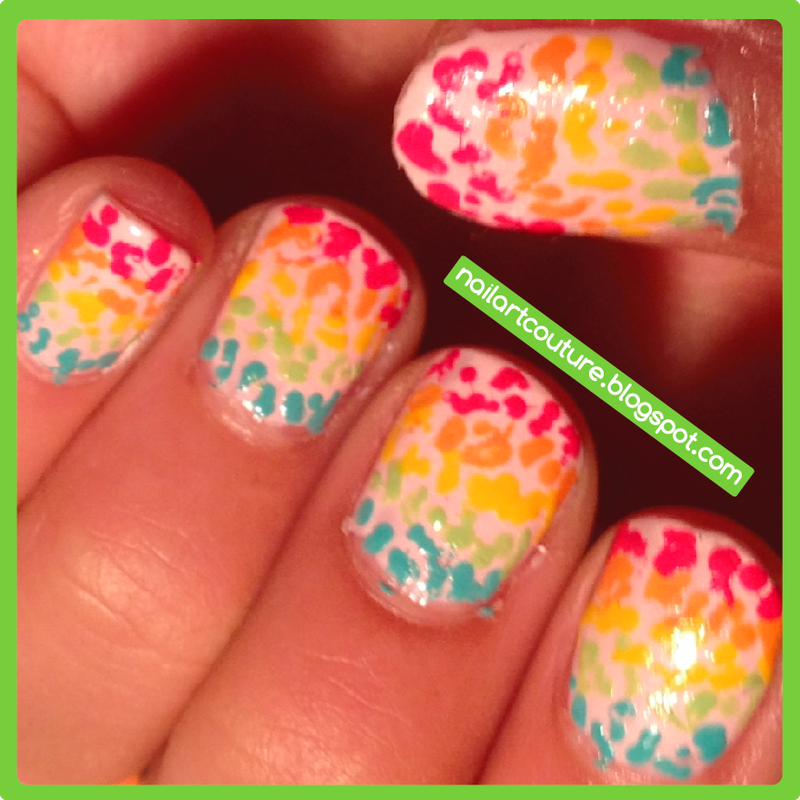 was wondering if you could do a peacock inspired nail and put a tutorial on your site? would be pretty sweet and greatly appreciated :D let me know". I did a feather nail art a while ago and it didn't really take that long so I figured peacock feathers can be done just as easily. 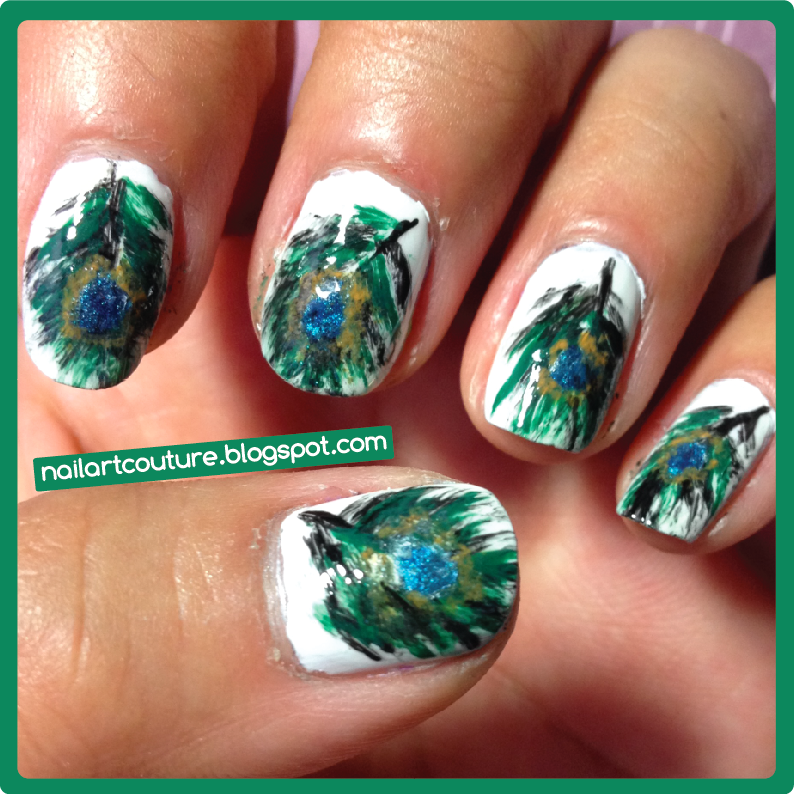 I saw a lot of peacock nail art available online and they all look very one dimensional. I like to take a realistic approach so it would look like you found tiny peacock feathers and stuck it on your nail with Top coat. I like that it looks slightly imperfect, rough, and uneven. 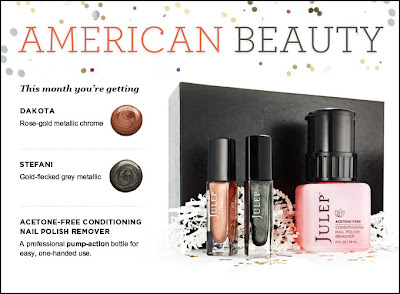 First and foremost, Happy 1 year Anniversary to Julep! I want to thank Julep so much for feeding into my obsession of nail polishes and just adding a little fun to every month. I thoroughly enjoy receiving their nail polishes every single month and it's one thing I always look forward to! They are hosting a digital party, I assume it going to be via Twitter. But more information can be found in their Facebook Event. Again, it's always the small touches that wins me over with this company. I love how they're celebrating digitally to get everyone involved. Looks like this month, the theme is all about chrome and metallics. 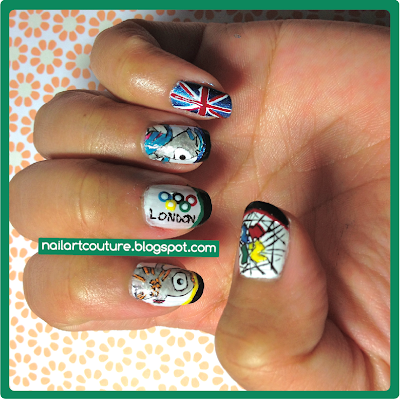 I think it's perfect for August since it's the month of the Olympics! I think I could do some cool Olympic medal nail art using these featured colors. The featured product this month is their Acetone-Free Nail Polish Remover which retails for $14.00. It looks really small, but it's 118 ml or 4 fl. oz. I love that it's a pump! In addition, Julep is also throwing in a super cute tote bag! So there are some things I noticed about this month. Instead of two add-ons, you get 3 for the usual price of $4.99 each! Last month, we were told that Kate in our box was a litte different from Kate featured in the past box. So I wonder if Sienna in the It Girl box is a little different because I have that already and I don't want dupes. 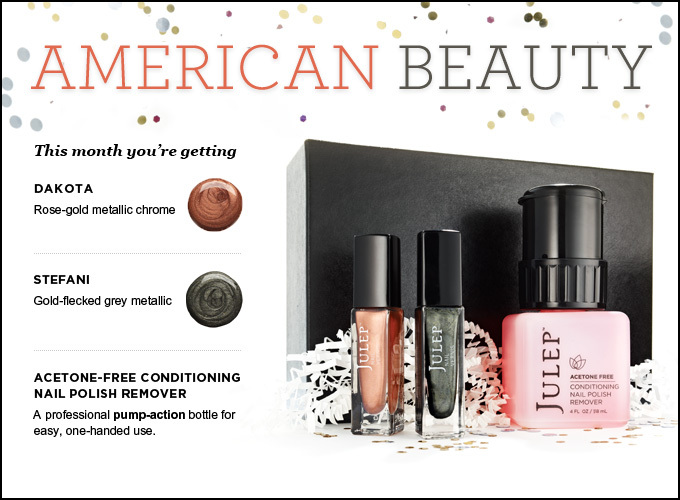 If you're new to the whole Julep Maven program, it's essentially a nail polish/Julep branded product subscription service. The regular fee is $19.99, but you can try it out for $0.01. Simply complete the style quiz and type in the promo code PENNY to reduce your price to a penny! As always, more details about the program can be found on their website or check out my Beauty Boxes tab above. 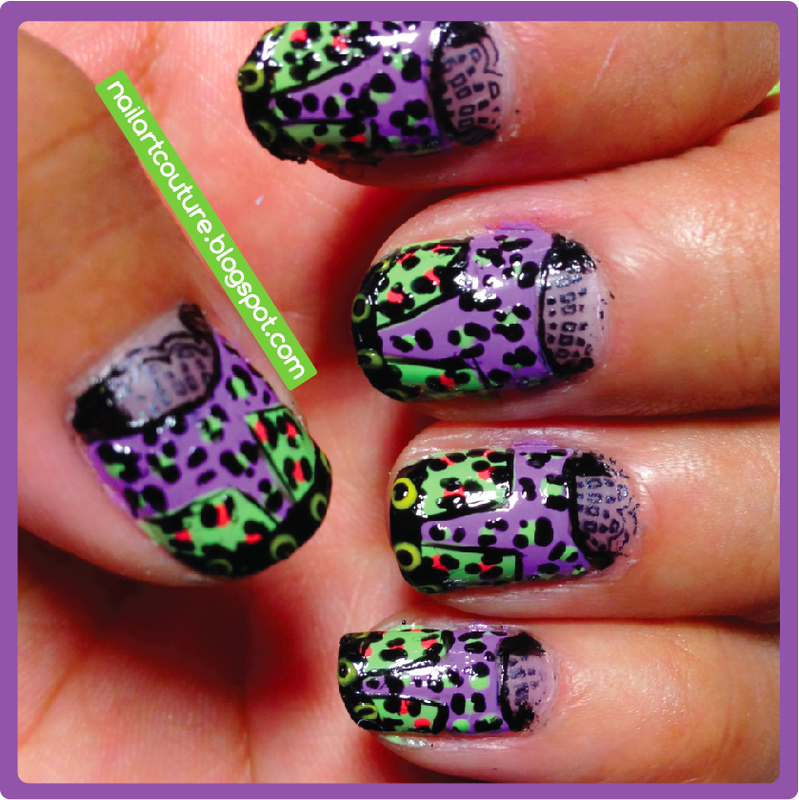 Here are the sneak peek for the August Julep Maven styles and their swatches! Happy 4th of July to all my American Readers! I need to do more holiday themed nails, but for some reason I just don't bother, maybe because it's so overdone. I like to create something that's really unique and one of a kind if possible, which is why I like to emulate fashion print so much. Anyways, I babysat my friend's little sisters today because she was out of town and their mom was working. Every time they come over, I would do their nails for fun. They really appreciate it because the next day they become the envy of all their friends. They always tell me how their little friends would ask them if their nails were fake, or where they got it done and so on. I told them that when they ask, just say that "you got an exclusive membership to Samantha's Salon". They always giggle at that! They think I'm going to actually open a salon one day. But honestly, doing other people's manicure and pedicure maintenance really grosses me out. But while I was painting their nails, they pretty much gave me financial advice on how much to charge for my nail art. They said "$15.00 for simple designs, and $50 per hand for complicated designs". They are my little promoters, so I said if they can find someone who will pay that then I'm in! 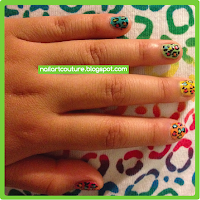 Anyways, I decided to do a rainbow leopard print nail art for Leslie (the older sister) so that it would match her shirt. For Lindsay, I did another version of a multi-colored leopard print. I just wanted to make it really colorful for them, since it's summer time and all. Enjoy the photos, they were my little models! Ladies have their Topboxes, Glymm bags, Luxe Box, Julep Box, and a couple other boxes too! What do you men have? Glymm MAN boxes! I believe this is the first and only men's beauty... I mean grooming box available in Canada. Unlike their lady counterparts, Glymm Man is a quarterly subscription service that includes 7 to 8 deluxe to full size samples. 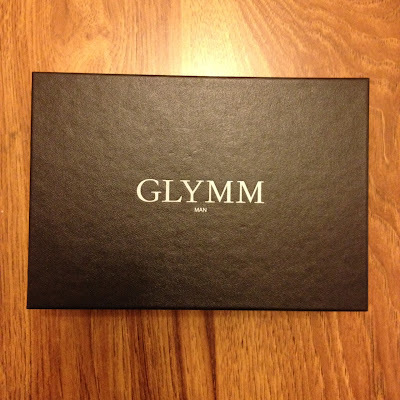 The price of the Glymm Man grooming box is $25 plus tax for every 3 months, which includes shipping. I think these are only big differences between this subscription and the women's Glymm subscription. Glymm Man has the same points and referral system, and they also have an online store available as well! Well, I'm sure you would have guessed that I didn't buy this box for myself. Nope, I bought this for the most important man in my life, my daddy for Father's Day! He is the least metro person ever and I'm sure he doesn't really give a crap about grooming products. But, I just wanted to introduce to him some high quality products that he could hopefully incorporate into his daily routine and just provide him with some travel size items. Anyways, I purchased this Glymm Man box back in February thinking the first box will come in March. It was a couple months later when I realized from their Facebook Update that they were going to ship the very first box in June, just in time for Father's day. I paid what I call an early bird price, because it was only $20 when I bought it and now they increased the price to $25 for new members. I believe right now the subscription is sold out. I haven't seen a lot of blog and vlog on the Glymm Man box, only two. Maybe it's not really "manly" to discuss products. Ladies have an abundance of beauty blogs and beauty channels, do guys have any grooming vlogs and channels? Anyways, I figure I would share my dad's box with my readers and curious passerby. The products came in a very sleek box, which is the same size as the previous pink Glymm box. It's very nice and sturdy! I guess Glymm didn't go digital with this box, because it came with a product information card that describes the product, how it should be used, how many times it can be used, etc.